Episode Twenty-four in the on-going series, Revelation: An Idealist Interpretation, was uploaded to the AIC’s You Tube channel on Wednesday. With this episode I begin my discussion of Chapter 19, with verses 1-10. Only one new illustration from the Bamberg Apocalypse is included this week, Folio 47, Jubilation Over the Fall of Babylon, which is one of the most colorful in the series. Watch the video. OR Listen to or download the Podcast version. One of the curiosities of Revelation 19:1-10 is the four uses of the Hebrew praise phrase Allelulia! These four are the only incidents of its use in the New Testament. Here it means there is nothing more to be said rather than the traditional “so be it!” St. John, like a weaver of tapestry, brings back threads from earlier chapters, including “small and great” and thunderings and lightnings. He also uses the wonderful Greek version of the title of God as Lord God Almighty, which in Greek is Kyrios o’ Theos o’ Pantokrator, but in the King James Version and New King James Version verse 19:6 is translated as Omnipotent, the only such incidence among the eight uses in Revelation. In all other uses the phrase is translated as Almighty, the form in which it is used in virtually every other English language translation. 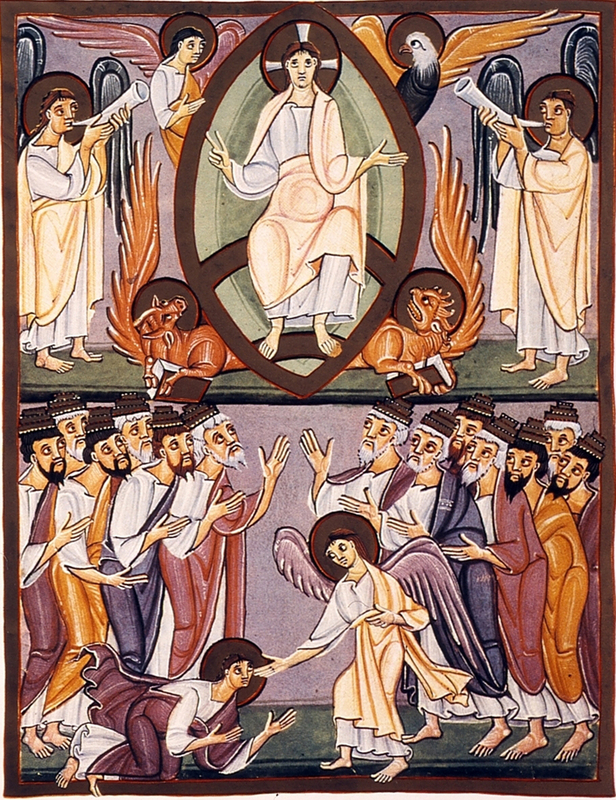 Other interesting highlights of Revelation 19:1-10 are the relationship between Christ and the Church as a marriage (for which I illustrate both the Old and New Testament precedents); the Fourth Beatitude in Revelation (19:9); and the angel’s first rebuke of St. John for falling on his knees in “worship” (Greek proskuneo): “See that you do not do that. Worship God.” The angel will do so again in Revelation 22:9. I discuss the difference between “worship” (of God only) and veneration, or paying homage (of religious objects and persons). The next AIC Bookstore publication, a paperback and Kindle version of the Revelation series, re-written to convert the video script into a written narrative form is underway. My target for publication is Easter 2016 A.D.